Frustrated by missed calls? Need more hours in the day to meet customer expectations? Here's the most cost effective answer: for a minimal monthly fee divert your overflow, unanswered or out of hours calls to us and only pay for calls taken. Most businesses experience peaks and troughs in call demand. By diverting unanswered calls to us your customer service will be enhanced by our trained professional operators offering a seamless addition to your capacity. By offering out of hours customer service who knows how much additional business you'll generate. We're open 8:30am - 9pm weekdays and 9am - 5pm at weekends. If that's not enough please let us know. As a company, Farm Stay UK have worked with The Carrier Group for over twelve years and throughout that time we've found them to be highly efficient, professional, friendly and extremely competent. Indeed, it would be very difficult to find an alternative company able to provide as good a service at such competitive rates. They're excellent value for money. 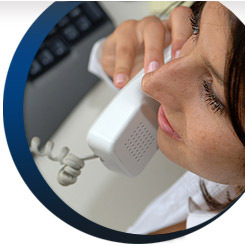 If you'd like more information on our overflow call handling or out of hours call handling services, please Contact Us or call Freephone 0800 198 1010. * Final contract prices are subject to agreed operational specifiications. Why not add a Service?